Conde, M.A. ; García-Peñalvo, F.J.; Piguillem, J.; Casany, M.J.; Alier, M.
The emergence of the Information and Communication Technologies and its application in several areas with varying success, implies the definition of a great number of software systems. Such systems are implemented in very different programming languages, using distinct types of resources, etc. Learning and Teaching is one of those application areas, where there are different learning platforms, repositories, tools, types of content, etc. These systems should interoperate among them to provide better and more useful learning services to students and teachers, and to do so web services and interoperability specifications are needed. This paper presents a service-based framework approach to facilitate the interoperability between Learning Management Systems and Personal Learning Environments, which has been implemented as a proof of concept and evaluated through several pilot experiences. From such experiences it is possible to see that interoperability among the personal and institutional environments it is possible and, in this way, learners can learn independently without accessing to the institutional site and teachers have information about learning that happens in informal activities. Conde, M.A. [et al.]. Interoperability in eLearning contexts: interaction between LMS and PLE. A: Symposium on Languages, Applications and Technologies. 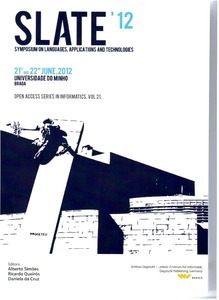 "Proceedings of 1st Symposium on Languages, Applications and Technologies (SLATE 2012)". Braga: 2012, p. 205-223.